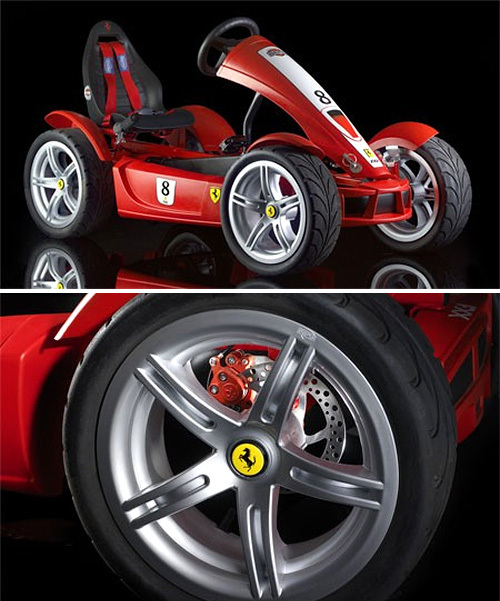 Ferrari FXX Pedal Car Almost As Awesome As The Real Thing | OhGizmo! If you’re going to make a pedal car based on the Ferrari FXX you have to go all out, and it looks like Berg Toys has done just that. While the FXX Exclusive model pictured above isn’t exactly a spitting image of the real thing, it comes with a list of features that make other pedal cars look like… well… a children’s toy. It’s got a seven speed transmission, an on-board computer, disc brakes and even semi-slick racing tires with Enzo inspired hubcaps. (Though I prefer the black hubcaps often seen on the FXX.) The exclusive version even has a racing-style bucket seat with a four point harness, a leather steering wheel and an aero kit to keep drag down while you’re roaring down the street at 10mph. While the Berg Toys website is still under construction at the moment, the FXX pedal car should be available next month through their dealer network as well as Ferrari dealerships. A standard model will run about $730 while the Exclusive model will run about $2,200. This is pretty cool. I’d like to see a cheaper, stripped down, non-ferrari themed version of this… hey- cheapskates need exercise, too!